Food inflation is set to decline further, thanks to a projected record rabi harvest. The country is poised for a record harvest this year. This is why prices of pulses like gram (chana) are down by more than 30 per cent, year-on-year. Onion prices have crashed, after their rise made headlines four months ago. Commodities such as groundnuts and maize are selling below their minimum support price (MSP). Sugar prices remain soft. The central government has nearly 43 million tonnes of grain stock - well above the 25-million-tonne norm. All indicators point to a bearish trend in food prices and a fall in food inflation in coming months. High food prices, witnessed primarily during the July-to-November period of the 2013/14 financial year, were a crucial factor in the recent state polls, and contributed to the dismal performance of the Congress. In a media interaction in early January, Prime Minister Manmohan Singh admitted that his government had not succeeded in controlling inflation. "This is primarily because food inflation has increased," he said. But the situation is changing. "If you compare January 2014 prices with those in January 2013, they will be more or less the same. 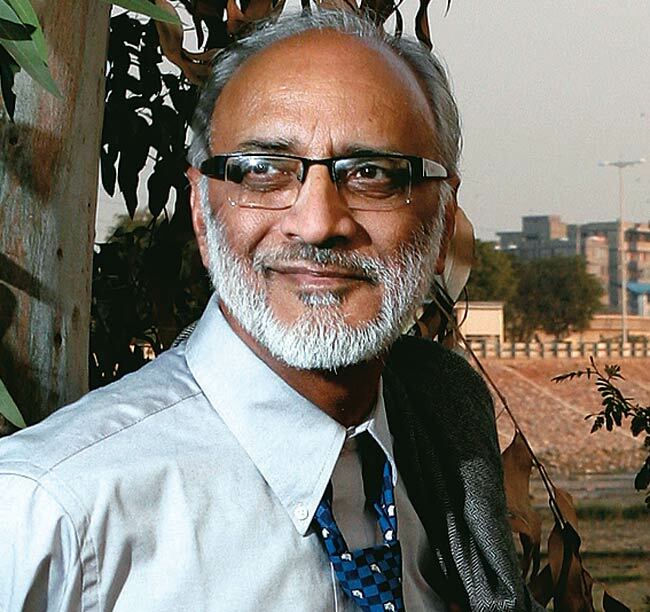 Going forward, prices will remain in control and food inflation will keep coming down every month for the next five months," says Ashok Gulati, Chairman of the Commission for Agricultural Costs and Prices, and a sector expert. However, he added that inflation would persist in items such as milk and meat, because of demand pressure arising from higher incomes. Government data shows milk prices in Delhi have risen by more than 13 per cent since January 2013, to Rs 34 per kilo. Onion prices crashed after remaining abnormally high in September-October last year. At the retail level, they were almost at Rs 100 per kg. They are now available at Rs 25 per kg. The government had to cut the minimum export price of the bulb from $1,150 per tonne in early November to $350 in mid- December, to encourage exports and prevent a free fall in domestic prices. N. R. Bhanumurthy, Professor at the National Institute of Public Finance and Policy, says: "Prices are off the peak. With estimates of a historically high agricultural output, one can expect prices of most edible commodities to fall. The downside, however, could be limited, since there will be some cost push inflation in these." Sugar prices have been depressed for more than a year. At the retail level, sugar is selling for Rs 35 to Rs 36 per kg in Delhi, compared to Rs 37 a year ago, according to data with the Department of Consumer Affairs. The same data shows that retail prices of gram dal, arhar dal, mustard oil and wheat are down, compared to last year. Declining prices of pulses provide huge benefits to Indian households where pulses form a dominant source of protein, says a December report by CRISIL. This is especially true for vegetarian households. India is indeed the world's largest producer, consumer and importer of pulses. "Pulses inflation will most likely remain significantly low in the next 12 months, as the rabi crop - which forms over 60 per cent of total pulses production in India - enters the market," the report said. Gram is selling for around Rs 2,900 a quintal in markets such as Indore and Bikaner, while its MSP is Rs 3,000. The MSP for new gram crop that will arrive April onwards has been increased to Rs 3,100. Groundnut prices have slipped below MSP in Gujarat, and the central government agency, National Agricultural Cooperative Marketing Federation (NAFED), has been called in to procure groundnuts at MSP. NAFED is also doing so in Rajasthan. Earlier, it had to similarly intervene when the market price of urad dal slipped below its MSP. 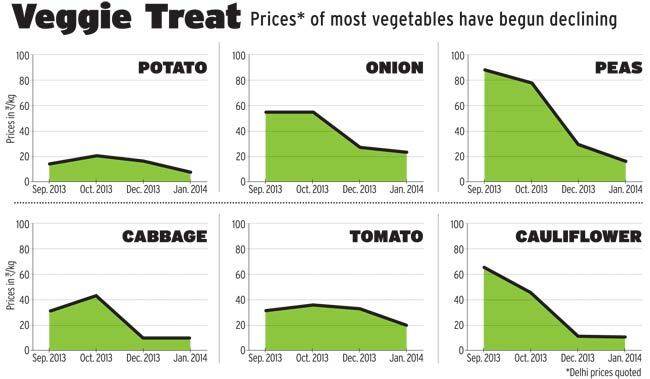 There is also marked decline in vegetable prices. Supplies have improved, but the increase in production must be sustained to ensure the inflation rate stays moderate. "Once there is a clear estimate of the rabi output, further easing of price pressure is possible," says Shashanka Bhide, Senior Fellow at the National Council of Applied Economic Research. Rising vegetable prices had also contributed to high inflation, and their cooling is reflected in the latest inflation data. In December 2013, wholesale price index-based inflation fell to 6.16 per cent from 7.52 per cent in November, triggered by the fall in vegetable prices. In December 2012 it had been 7.31 per cent. 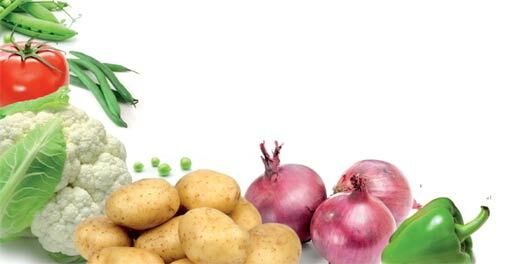 Commenting on the vegetable price outlook, Pradipta Sahoo, Business Head at Safal, the vegetable and fruit retail arm of Mother Dairy, says: "No abnormal price fluctuation is expected in vegetables until at least mid-April if weather conditions remain normal." As of January 1 this year, the government had 15 million tonnes of rice and 28 million tonnes of wheat in the central pool, for sale through the public distribution system at subsidised rates. Rice procurement is currently on, and fresh wheat procurement will begin from April. The large stock in the government kitty ensures that open market prices do not rally, as the government can intervene any time if required. Agriculture Minister Sharad Pawar said recently that the country was likely to harvest a record 100 million tonnes of wheat in the 2013/14 crop year (July to June), beating the record of 94.88 million tonnes in 2011/12. The sowing of rabi crops such as wheat, oilseeds and pulses is progressing well, and is above last year's levels. After the rabi crop is harvested in April and May, prices will drop further. A Food and Agriculture Organization report in November 2013 noted that incremental import requirements of edible oil by India in 2013/14 should be small, compared to previous years, because of the domestic harvest. The United Progressive Alliance government had to deal with the untamed price rise of the second half of 2013, following erratic and unseasonal rain in some states. But things are changing. It remains to be seen who reaps the political benefit of moderating food prices.